An effective, user friendly, ready-to-use, water based, HSE (No:9067) approved insecticide for use on carpets, upholstery, fabrics and hard surfaces. Simply spray on and leave to dry naturally, the insecticide is ideal treatment for eradication of infestations and control of most crawling and flying insects including fleas, ants, bed bugs, beetles, cockroaches, fleas, flies, mosquitoes, wasps and moths. Ready-to-use and suitable for the treatment of infestations in all porous and non-porous surfaces, soft furnishings, carpets, upholstery and roof voids. 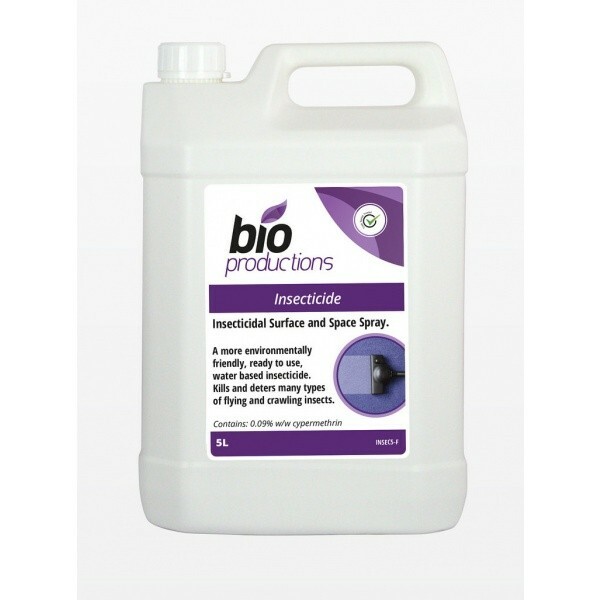 Bio Productions Insecticide remains active after application for at least 14 days, eradicating insects emerging from eggs. Not suitable for use on grain, or in grain stores or for treating clothing. Use Insecticides (or Pesticides) safely. Available in 5Lt or 1Lt trigger spray bottle.